Caused by: Laetisaria fuciformis (McAlpine). The symptoms depend on the grass species and severity of attack. 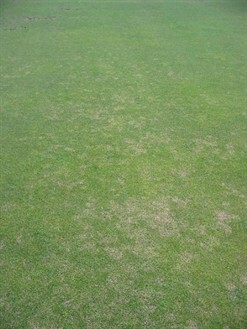 Symptoms often start as small mostly circular patches of dead leaves interspersed with live plants. The patches may also have a pink tinge (Plate 2). 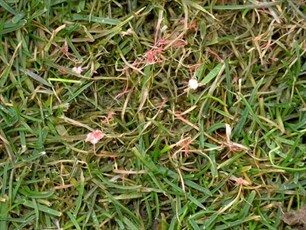 Closer inspection will reveal pale pink to red needle or horn-like outgrowths (the red threads - Plate 2) Pink flocks of mycelium (resembling candyfloss) may also be present in conducive conditions. Where is Red Thread found? Any area of turf, especially golf greens, tees, fairways, bowling greens, lawns, parkland and sports pitches. When is Red Thread likely to attack turf? When growing conditions are good infection may be transient but under poor growing conditions attacks may be severe. Red Thread does not commonly affect the playing quality of the turf but reduces the aesthetic appearance. Red thread may thin the sward. Fescue is the most severely affected, although there is variation among subspecies and cultivars. Lolium perenne is also very susceptible. Use recommended rates of fertiliser at the recommended timing to prevent low fertility problems occurring. Oversow with grass varieties that are less susceptible to red thread. Maintain good drainage and manage the turfgrass to reduce surface moisture. Collecting clippings helps to prevent the spread of infected material. Trials have shown that Heritage controls red thread.